What used to seem like an unlikely dream is now becoming a new standard: steadily advancing your career, having all the money you need, and having a wonderful life all around… well into your 70s, 80s, and 90s! Or slow down, travel more... spend time lowering your golf scores... doing whatever pleases you in life. Good health can follow us our entire lives… when we know how to make that happen. My name is Dr. Mark Hyman, and I'd like to see your health span actually match your life span, where rather than going slowly downhill for the last 20 or 30 years of your life, you go full steam right to the end. And you know what? YOU CAN! As the former medical co-director of Canyon Ranch — a world-famous health resort where I saw patients every day — I've been practicing a new kind of medicine called ultraprevention for the past nine years. This type of "medicine" works for absolutely everyone — whether you are very healthy, very sick, or anywhere in between. That's because ultraprevention, unlike conventional medicine, is based on principles and practices that work with your body rather than against it. You can go from feeling okay to feeling fabulous. You can be free of fears of getting cancer, heart disease, or Alzheimer's. And you can find the right rhythm for your life so you can get and stay well for the rest of your days. The power of this plan lies in five amazingly potent, science-based wellness secrets. I've showed countless patients how to effectively apply these secrets, and I have used them myself, with life-changing results. Now I'd like to share them with you. Many years ago, my life was out of control. I had just moved from China to the mountains of western Massachusetts to raise my two children. I ended up working in an inner-city emergency room in Springfield. This job took a serious toll on my psyche, my health, and my family. Like many doctors, I believed I wasn't subject to the same rules as everybody else. I often went for days taking just short naps... working difficult night shifts... eating poorly... and drinking quadruple espressos at eleven at night to make it through the next shift. This went on for years. And though my body sent me plenty of signals to slow down, I completely ignored them. One day I went to an amazing nutrition conference that changed the course of my life. I realized I had to change the way I worked. Two weeks later, I was offered the position of medical co-director at Canyon Ranch. Funny thing is, I hadn't applied for the job. Serendipity simply landed me in the right place at the right time. My life was so stressful, it created enormous physical pain. So much so that I often thought I would have to go on disability. My whole system was in chaos: My eyes were surrounded by rashes; my tongue burned; my muscles ached; my digestive system was a total mess; and I was exhausted and miserable. Eventually I realized I was suffering from chronic fatigue syndrome. I'm not sure how I ingested the mercury. It could have come from eating too much mercury-contaminated fish or from my dental fillings. Or it may have been from pollution generated by the heavy coal burning in Beijing. Regardless, I started a self-administered program to remove the mercury from my system. I used various nutritional supplements, including garlic, vitamin C, and algae. And I used other therapies, such as sauna treatments. I also restored a healthier rhythm to my life. I made sure I had regular sleeping, waking, eating, resting, and working patterns. I stopped relying on caffeine and sugar to keep me going. Instead I started using nutrients and herbal therapies that healed my digestive system and repaired my damaged immune system. And when my body talked, I listened. My journey back to health took me through a process of physical, psychological, and spiritual renewal. It allowed me to heal completely. Can anyone take control of his or her own health as I did? OF COURSE! Our medical establishment doesn't teach doctors how to keep patients healthy. It teaches doctors how to diagnose and treat disease. That's what's so empowering about the wellness secrets I'll share with you. Once you're aware of these secrets, you'll no longer be dependent on the healthcare system to keep you well. You'll know everything you need to know to stay healthy for the rest of your life. that can make you sick! For years you've heard that eggs are bad for you. Why? Because they are high in cholesterol. And why is that a problem? Because high cholesterol causes heart disease. Well, here's a bit of news: Both of those statements (eggs are bad for you and high cholesterol causes heart disease) are WRONG. Now most doctors will tell you that heart damage results from having high levels of cholesterol that clog the arteries leading to and from the heart. But a few years ago, a group of Harvard University medical researchers discovered that half of all heart attack victims actually had LOW cholesterol. The reason? It's because heart disease is really a disease of inflammation. Inflammation is your body's first line of defense against injury or infection. It's what causes your skin to turn red when you get burned or a bruise to swell as your body heals itself. However, sometimes the inflammation process doesn't switch off. Like a low-grade fever, it simply continues to smolder, traveling from cell to cell. When this happens, it becomes a chronic condition that damages, among other things, the lining of your arteries. Articles in the Journal of the American Medical Association (July 4, 2001) and the New England Journal of Medicine (June 17, 1999) indicated that cholesterol begins to accumulate only after the arteries are damaged by inflammation, regardless of the amount of cholesterol in your bloodstream. Eggs are actually good for you. I won't bore you with all the critical nutrients that are found in eggs, but think of it this way: All the nutrients in the yolk are put there to create an entirely new life. These are just a couple of the dozens of myths that are widespread in modern medicine. Why am I so interested in exposing and correcting these myths? Because I have been a victim of these myths as much as anyone else. The biggest problem with them is that your doctors may actually believe some of these myths. If so, they may be unwittingly damaging your health more than they are promoting it. Once you stop believing in these myths and start applying the strategies that address The 5 Forces of Wellness, you'll have your very own personalized road map to health. And that, dear reader, will give you all the information you need to get well and live life full out. I had to become very ill before I realized how outdated our current medical model really is. For decades the medical establishment has broken healthcare into a bunch of different specialties. So if you have a heart problem, you go see a cardiologist. If you have a malignant tumor, you go to an oncologist. If you have a blood problem, you see a hematologist. But that's not at all how your body works. Your ears, nose, and throat don't work independently from your digestive system, immune system, or any other part of your body. Everything is connected and works together to create a miraculous, highly functioning organism. Here's another problem with how we practice medicine. Medical researchers are constantly seeking different treatments for different diseases. You may be thinking, why not? Parkinson's is different from cancer, so the treatments must be different, right? Scientists have now discovered that disease results when one or more of FIVE forces take hold in the body. When one of these forces is present in your body, it sets off a chain of events that can wreak havoc on your whole body from the inside out. So if a problem starts in your stomach, it can end up causing skin problems. These forces are the source of more than 90 percent of today's most common diseases and health problems — including heart disease, asthma, cancer, diabetes, obesity, stroke, eczema, Alzheimer's, and many, many more. YES, I'd like to stay healthy for my entire life to maximize my income, maximize my enjoyment, and maximize the years I have on earth! Maybe you woke up this morning with a small ache in your back. You didn't want to get out of bed because your energy was low. And perhaps your stomach was a bit queasy. You may wake up each morning thinking this is just what happens when you get older. But you're wrong. Like thousands of people all across the country, you can get rid of these kinds of problems, and whatever else ails you, and feel fully alive again. Easier and faster than you would ever think. When I got sick, I knew the only way to fully recover was to take control of my own health. So I started studying the world's latest advances and concepts in how the body functions. And I applied what I learned to my own body to recover from my incurable illness. Since then, I've been teaching other physicians the powerful science of staying healthy. And I've used this science to help hundreds of my own patients get well. Even if they were feeling very healthy when they first came to see me. Now, I've distilled all of this information into a simple three-step system for personal health and well-being. 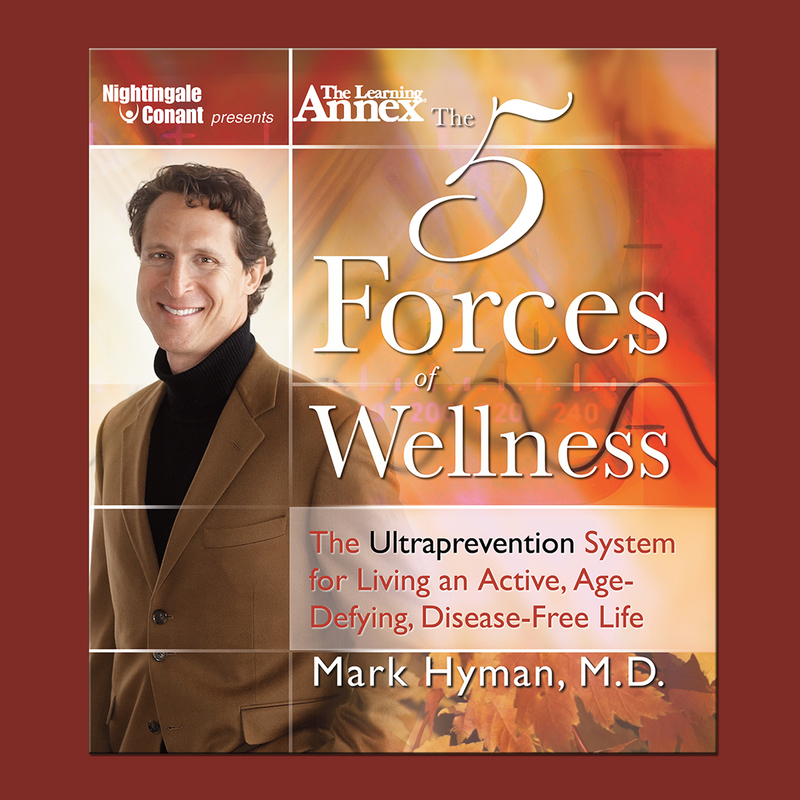 The whole system is laid out for you in my audio program, The 5 Forces of Wellness: The Ultraprevention System for Living an Active, Age-Defying, Disease-Free Life. In it, I tell you exactly what thousands of people have done to create a lifetime of good health. Before I tell you all about the program, I want to let you in on a little secret — the one thing that makes this system so incredibly effective. Everybody's needs are different. So, The 5 Forces of Wellness are personalized to you. You'll also learn all about the five forces that trigger more than 90 percent of today's most common diseases: sludge (malnutrition), heat (inflammation), burnout (impaired metabolism), waste (impaired detoxification), and rust (oxidative stress). Then you'll learn the three essential steps that stop (or balance) these forces in your body. You'll get all the tools and information you need to bring your body back into balance and feel fully healthy and engaged. Do you ever find yourself wondering what it would be like if your body operated at full tilt? Once you figure out how to work with your body, you'll be amazed at how quickly nagging problems melt away. Not only will you look and feel better, but more important, you'll take control of your health, rather than leaving it in the hands of the healthcare system. In as few as 5 to 10 days, many of the conditions — such as congestion, heartburn, gas, constipation — you've been living with for weeks, months, or years can automatically correct themselves. That's because all of these symptoms are signs of imbalance that can be easily corrected with the three simple steps you'll learn in the program. You won't know how bad you felt until you start feeling good. In an ideal world, we'd all have perfect health in our 90s or even our 100s. But this isn't an ideal world. You know as well as I do, if you want to enjoy vibrant health all of your life, you have to do more than hope that it happens. I promise you this. Once you stop falling for the myths that can make you sick and start applying what you'll learn in this program, your chances of being healthy for the duration of your life will increase dramatically. So use this new model of medicine to take control of your own health and live your life to its very fullest. That is the ultimate aim of ultraprevention. And, frankly, it's hard to imagine a more empowering goal. Whenever I speak at a conference, people ask me for the fastest ways to lose weight, boost their immune system, protect their heart, improve their digestion, and a host of other common health problems. So I published a guide called Small Changes, BIG REWARDS: Five Ultraprevention Steps for Alleviating 25 Common Health Problems. This e-Book tells you in clear, no-frills detail exactly what steps you can take TODAY to reverse many common health conditions. Even if you don't have any current health problems, what you'll find in this report can add extra years to your life and perhaps even save it! This BONUS cutting-edge e-Book is now included with this program. I'd like to stay healthy for my entire life to maximize my income, maximize my enjoyment, and maximize the years I have on earth! The 5 Forces of Wellness, at the special price below. - I can select one of two ways of ordering. The former Co-Medical Director at Canyon Ranch Lenox, an internationally acclaimed health resort, Dr. Mark Hyman has combined the best of conventional and alternative medicine with a blend of science, intuition, integrity, and compassion. He is the co-author of the New York Times bestselling book Ultraprevention, the Six-Week Plan That Will Make You Healthy for Life, and winner of the Books for Better Life Award. Dr. Hyman is also the author and creator of The Detox Box: A Program for Greater Health and Vitality. He is Editor-in-Chief of Alternative Therapies in Health and Medicine, the most prestigious journal in the field of Integrative Medicine. Dr. Hyman was also a regular medical contributor on many television shows including CBS This Morning, Today Show, Good Morning America, CNN, and The View, Katie and The Dr. Oz Show. He was featured on the PBS television special Get a Life. He has been heard on NPR and many other radio programs, and is quoted regularly in popular magazines, including Natural Health, Health, Self, Town & Country, Elle, Fitness, Glamour, Shape, and Family Circle. “A great program! After listening to this program, I changed the way I was eating and began an exercise program. I lost 30 pounds, and have kept it off for more than a year. I eat wonderful foods, and I am never hungry while following his advice (basically, eat natural foods, no refined sugar, no trans-fat, no white flour, and low saturated fat). He also will teach you what kinds of fat are good for you! I should also note that my blood lipid profile (cholesterol, triglycerides, etc.) went from "high-normal" to "excellent." My doctor was amazed! He said that 95% of his patients would just get a prescription, but I did it by following Dr. Hyman's advice. By the way, I am 49 years old, and feel great!” – George H.